Mahindra recently launched the new Scorpio Adventure in India for a starting price of ₹ 13.07 Lakhs (ex-showroom, Mumbai). Based on the Mahindra Scorpio S10 variant, the SUV packs in a lot many additional features, equipments and style decals that go well with the adventure theme. A few of this new features include gun-metal alloy wheels with red callipers, ORVMs with side indicators, the super-slick 'smoked' tail lamps and the new Mist Silver-White dual-tone exteriors with adventure-themed graphics among others. Other than these additions, the SUV remains very similar to the standard version as far as chassis design and dimensions are concerned. The company has announced that the production of Scorpio Adventure shall be limited to just 1000 vehicles. On the interiors, the cabin of Scorpio Adventure has been refurbished with new faux leather seats with blue fabric inserts, along with faux leather-wrapped steering wheel and gear lever. There's a rear-mirror camera and the dashboard sports the Adventure badging. The vehicle is available in both 2-wheel and 4-wheel drive alternatives and shall be offered only with a 5-speed manual transmission. 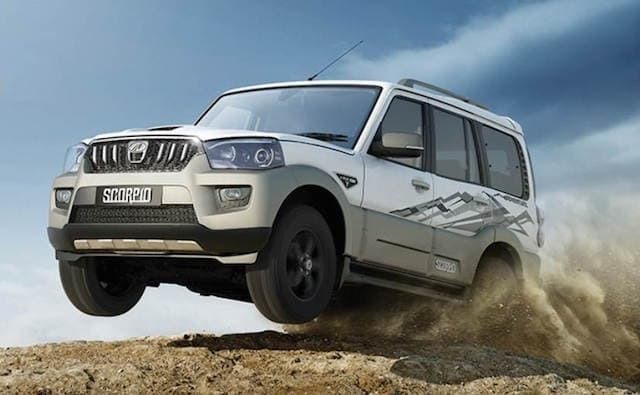 The new Mahindra Scorpio Adventure shall derive power from both 2.2-litre mHawk and the new 1.9-litre mHawk, the latter specially developed for Delhi and NCR region which banned diesel vehicles with a capacity of 2000cc or more. Both engines offer equal power output of 120bhp and a peak torque of 280Nm. Vivek Nayer, Chief Marketing Officer, (Automotive Division) Mahindra & Mahindra Ltd. commented on the launch stated that Scorpio with its all-terrain capability, superior performance and iconic design has made millions of Indians aspire for the vehicle. The limited edition SUV is in line with the brand's DNA, and it will only add more to the appeal of Scorpio in off-roading and long road trip adventures.